ROC is Fred Browning (vocals, music), Karen Sheridan (vocals, music), Patrick Nicholson (music). Over three albums and fourteen singles/EPs, from “God Willing” (1993) and “Girl With A Crooked Eye” (1994), to 2006’s “Night Fold Around Me”, ROC have delighted and confounded fans and critics, ignoring musical boundaries to create what has been variously called ‘the sound of paranoia’, ‘toxic euphoria’, as well as ‘startling, beautiful and addictive’. ROC have been labelled ‘perverse’ and ‘uncategorisable’. Rather than rehearse the cliches of a selected genre (like some of their contemporaries), they view the whole of pop (and beyond) as theirs to play with. They started out making tapes from lined-up cassette-players, dictaphones, drum-machines, guitars, keyboards… dance beats flowed into rock ‘n’ roll, through spoken word, pop melodies and into electronic/industrial noise. With sampling technology emerging as they made their first releases, ROC were unlikely to restrict themselves. “their references are as broad as the Severn Bridge, from Velvet Underground to Phil Spector, DJ Shadow to Kraftwerk, kitsch rock to Europop, but that doesn’t matter because ROC still make it sound like they’re treading through virgin territory.” (Melody Maker 1996). ROC began in the late 80s as a loose collective revolving around Fred and Patrick (who had met at school), recording on various floors around London, swapping available instruments and gadgets. An early version of the group played a festival in Warsaw (in communist Poland) in 1987. By their debut single ‘Dead Step’ (1993) ROC was Fred and Patrick plus Karen Sheridan (a Glasgow native whose family emigrated to Colorado when she was a child), Russell Warby, and Peter Burgess who recorded ROC’s first five singles/EPs in his Brixton studio. From their first tapes ROC had often used speech fragments for a track’s vocal part, and “Dead Step” is built around a voice (Russell) on an answerphone, floating in the ether. French magazine Les Inrockuptibles said: “Can here, ambient hip-hop there, everything frosted and flowing, perfect for summer”. 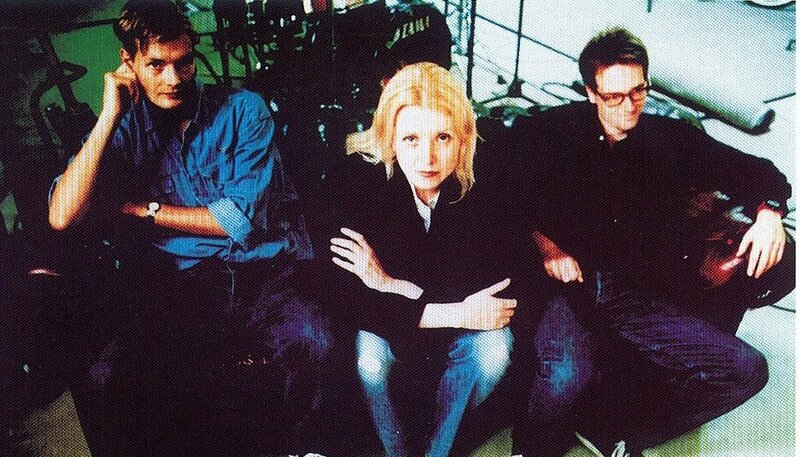 However as recording/writing continued, Fred and Karen’s voices became the group’s focal points and as ROC recorded their debut album the group was a trio of Fred, Karen and Patrick, plus collaborators including bassist/producer Gareth Huw Davies. Early singles displayed a tendency to black humour. “Girl With A Crooked Eye” is a story of domestic violence on the Costa Del Sol, and “X-ine” (1994) contains the line “I hope you both get Aids”. But the debut album “ROC” (Setanta Records 1996) revealed more personal, exposed material: forlorn breakup songs, screaming rants and self-loathing. But they weren’t above upbeat pop (“Hey You Chick!”), dreamy instrumentals and spoken word. Plus all manner of sound effects, phone messages, taped conversations, fragments of tv and radio; “Excised” starts with a secret recording of a friend’s wedding. “ROC” was co-produced with Danton Supple (Coldplay, Morrissey), who continued to work with ROC on their subsequent albums. Branded pranksters by some music professionals, ROC’s story is one of committed perseverance. They gained a ‘difficult’ reputation when their label wrote an open letter to the London music industry warning people against working with them. Despite (or because) of this and the critical response to “ROC”, the group signed to Virgin/EMI in 1996 and released a second album, “Virgin” in 1997. The album was so-titled after the label agreed that the artwork would simply be the famous Virgin logo printed full size across the front, an undertaking broken at the last minute on grounds that ‘retailers would think they were advertising Virgin shops’. But while ROC were enjoying the recognition, Virgin’s executives were at war. ROC’s A&R man left the company, and the group lasted another year on the label before being dropped while recording a third album in 1999. In 2002 ROC issued a 12″ of “I Want You I Need You I Miss You” (from the first album) as remixed by long-time collaborator and dj Nicky Holt (aka Solah). The single drew warm responses from club djs, among them Richard Norris (The Grid), Chris Carter, and Headrillaz, and became a summer favourite at Cream in Ibiza. In 2004 ROC they were back in the studio (completing the album begun at Virgin) with long-standing collaborators Danton Supple and Gareth Huw Davies at the desk. “Night Fold Around Me” was completed in Spring 2005. In 2005 ROC joined forces with new electronic label 12 Apostles to release a follow-up single “Journey to the Centre of Brixton” made Playlouder.com’s readers poll best singles of 2005, with radio play on BBC Radio 1 and 6music. A limited 12″ was issued with hand-assembled artwork and remixes by Ollo, Oh Astro and Bullet Proof Sounds.